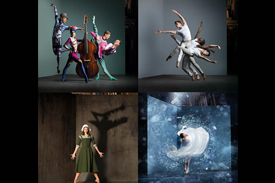 Scottish Ballet recently announced its 2019/2020 season including the world premieres of Helen Pickett’s The Crucible opening the Edinburgh International Festival dance programme in 2019, and Christopher Hampson’s The Snow Queen in Winter 2019. To create new work on an unprecedented scale, Scottish Ballet also launches Five in Five, aiming to stage five new full-length ballets in five years. The special anniversary season receives its opening in the Highlands, at Eden Court in Inverness with Spring!, a double bill. Dextera is a world premiere of a new work by Scottish Ballet Resident Choreographer Sophie Laplane, with music by Mozart performed by the Scottish Ballet Orchestra. Sir Kenneth MacMillan’s Elite Syncopations forms the second part of Spring! with its witty psychedelia and ragtime nonchalance. MacMillan’s choreography spans the decades, melding 1920s social dances with classical ballet. The Digital Season returns for Scottish Ballet with a month-long programme of work featuring short films, live streams, virtual reality experiences and digitally driven projects to enhance, alter and inform the way we experience dance – the Digital Season explores our grasp of reality, identity, and transformation. Zachary Eastwood-Bloom will create bespoke artworks using digital technologies such as 3D scanning, digital 3D modelling and 3D printing to transform traditional sculptural materials such as bronze, marble and ceramic. Arthur Miller’s masterpiece of power and persecution, The Crucible, is transformed into a gripping new ballet with choreography by Helen Pickett and a haunting new musical score from Peter Salem, performed live by the Scottish Ballet Orchestra. The ballet will receive its world premiere at Edinburgh International Festival. With a specially adapted score from works by Rimsky Korsakov, the world premiere of The Snow Queen is an inspiring story of love and friendship, driven by three central female characters. Choreographed by the company’s CEO/Artistic Director Christopher Hampson and designed by award-winning Lez Brotherston, The Snow Queen will join Scottish Ballet’s highly popular family repertoire.